I am a visual guy and have been taking pictures for over 50 years. This blog began as an attempt to learn digital image-making and share the experience with other novice shooters. After more than three years, it has become a place to share images of travels, photography tips and the occasional rant for fun. Thank you for visiting. Before I visited and photographed the Arkansas State Capitol, I went to see a landmark in our nation’s civil rights history. It seems a suitable note for Black History Month. Built in 1927, Little Rock Central High School was, at the time, the largest and most expensive high school constructed in the nation. By 1957, I was an elementary school kid in New York and remember when the big national news story was about the simple act of a few students trying to go to school. Three years after the Supreme Court found public school segregation unconstitutional, Little Rock could no longer delay integration. 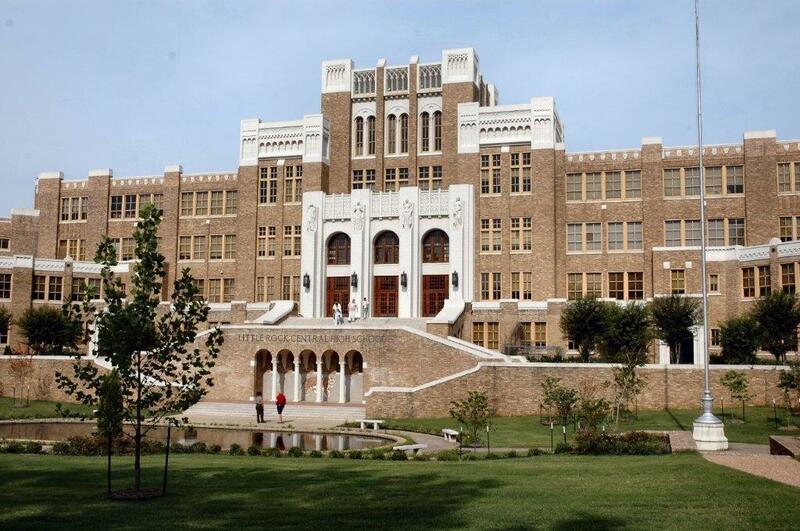 A federal court order had to be implemented to allow nine brave black kids into Central High. The neighborhood erupted in protest and Arkansas Governor Orval Faubus activated the National Guard to keep the kids out. President Eisenhower trumped Faubus by sending in troops from the 101st Airborne Division. images that always appears when the story of Central High is told. authorship, it took much digging to find one attribution. credits Will Counts for taking the picture. Even with the increase in reported incidents of racial animus of late, it’s difficult to imagine how bitterly, openly hateful some white folks were…not all that long ago. 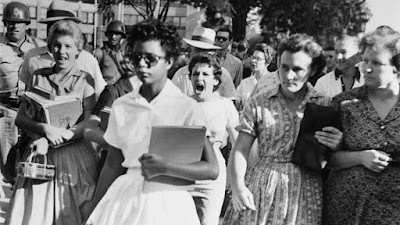 I had to add this shot from those tense days in Little Rock. Can you just feel the warm welcome they got from their fellow students and neighbors? Not so much. They were cursed and threatened in the street and ignored by everyone once they entered the building. In 1957, 92 years had passed since the Civil War ended slavery (I know it was the 13th Amendment). The point is it took well over a century to make things right…legally at least. Today, we can point to examples of backsliding. My wife observed that in our nation’s long history, we have generally trended in a positive direction. Some problems certainly took too long to redress but the overall path of the country seemed progressive. She never thought there would come a time when improvements were curtailed and the nation would go backwards. Since 1998, the school and some nearby properties have been designated a National Historic Site. It’s worth a visit if you are in Arkansas’s capital. Born and raised in New York City. Drove a taxi at night while getting a degree in Biology. Graduate education was in invertebrate zoology and environmental science. Bailed on a Ph.D. to work as an environmental consultant. Directed a biological survey of the lower Mississippi River which was sponsored by a big electric utility in New Orleans. Wound up employed by that utility, then another in Maryland for the next 28 years. I did environmental issue management and operations support for the industry. This required staying abreast of the scientific developments, tracking and participating in legislation and regulatory initiatives at the federal, state and local levels and ensuring compliance with final requirements. This background has cemented an interest in politics, science, current events, public affairs and the media. Retirement has given me time to travel, chase images and pay more attention to things that interest me and/or make me nuts.